Today I’m really wanting to reach out to all the parents of Thomas the Tank Engine fans. I know there are a lot of you! I’ve got a really lovely surprise for you today which I think you will love. 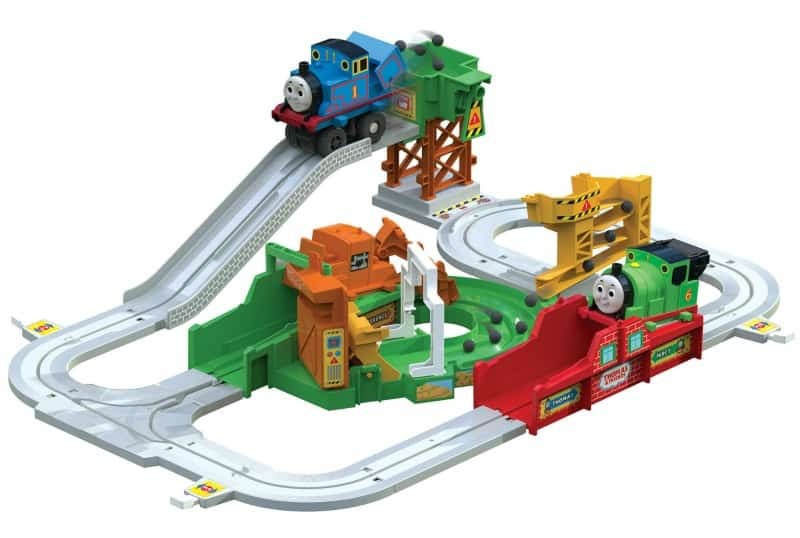 Have you seen the Thomas & Friends Big Loader Sodor Island Delivery Set yet? If you haven’t I think you are in for a real treat then. Thomas will always have a special place in my heart as my son loved him growing up. When I saw this toy I really wanted to feature it on the blog for a little bit of nostalgia on my part I think. If the Big Loader’s Thomas & Friends Sodor Island Delivery Set had of been available when my son was a preschooler this toy would definitely have featured on his Christmas list for sure. The Delivery Set comes with Thomas the Tank Engine, Percy and Terrance the Tractor. The characters work as a team delivering coal to the island of Sodor and it’s really clever how it all works. Percy collects the coal from the mine and drops if off for Terrance. The motor passes between Thomas, Terrance and Percy so they all get to play their part dropping of the coal. The pieces of coal go through the run, and get scooped up by Terrance and placed in Thomas’s engine. He then does a very nifty reverse manoeuvre and returns them to the mine. As a child’s first train set goes, the Big Loader’s Thomas & Friends Sodor Island Delivery Set is really fun and has lots of lovely features for little one’s to enjoy. I was so excited about the Big Loader’s Thomas & Friends Sodor Island Delivery Set that I asked TOMY if they would be happy to offer one as a prize for one lucky Zena’s Suitcase reader. I was delighted when they said yes so I’m really excited to be sharing this giveaway with you today. If you would like to win a Big Loader’s Thomas & Friends Sodor Island Delivery Set for your little Thomas the Tank Engine fan, all you need to do is enter via the Rafflecopter below. Competition closes on 31.10.18. Other T&C’s apply. Feeling lucky? Win a £50 AMAZON VOUCHER here. Know someone who would love this giveaway? Share it with them now so they don’t miss out. We have been provided with the Thomas & Friends Big Loader Sodor Island Delivery Set for the purposes of this giveaway. Wow I know a little boy who will LOVE this! My husband makes/builds garden steam railways/engine/carriages (from scratch not kits) so we are a bit train mad in this family , needless to say that our granddaughter is being encouraged with the family obsession, so this set would be fantastic, if she could prise her granddad off it long enough to play with it herself!?! I’d love to win this for my little nephew. It is his birthday in December and he loves Thomas and friends! My nearly 3 year old would go crazy for this. He’s a massive fan of Thomas ‘choo choo’. He could have hours of fun with this. I would love to win this for my niece, it is such a lovely prize. I would love this for my little Grandson……and me! He loves Thomas and would really be thrilled with this. I would like to win this for my youngest nephew, it would make a great present. I would love to win this for my little man. He used to only play with toy cars, but he has recently started to show an interest in trains, this would be a great start for his collection. I would like to win this toy as it looks like a great quality product. I would like to win it as it would make my nephew really really happy! I would love to win this for my nephew, he is Thomas mad! I’d love to win this for my little nephew as he loves Thomas. My nephew would play with this all day long. He’s got his birthday coming up too. I would love to win for my son Arthur, he is three and absolutely loves Thomas and Friends. He rarely plays with anything else. He would love this set. The children all love Thomas – even the older ones – and there is something enduring about transport-related toys. Fabulous. Sorry no social media accounts to share but thank you for the giveaway. My grandaughter totally loves Thomas the Tank Engine. I would love to win this, my nephew loves thomas so much he insists we call him Thomas, which is not his name ! My 4yr old son loves Thomas, and we have a few of the tracks already, even our 1yr old likes to have a go at pushing the trains about, so the Thomas sets will be loved for many more years to come! My Great Nephew loves Thomas, and this set would be a great Christmas gift for him . I’d love to win so I could put it away for christmas as a special present for my boys. My niece is probably more mad on Thomas then my Nephew her twin brother I would love to win this for them both i think they would have hours of fun. My Godson would absolutely love this, he’s mad on trains, and his love started with Thomas the Tank Engine! this would be ideal for nannies house when the little ones visit! I’d like to win because it’s my sons birthday on the 15th October and we’re teally struggling to afford anything for him. I’d love to win this so I could give it to my nephew for Christmas! I’d definitely earn some good aunty points. My boys love trains, especially Thomas!! I would love to win this as my nephew adores Thomas and we would have hours of fun playing with this together! Got a train mad nephew who would have hours of fun with this. My grandson would love this, he is a big thomas fan. His little face opening this would be priceless. Like most little boys, my son is OBSESSED with anything Thomas related! In fact, anything with wheels! I would love to win this for my little boy, he loves Thomas! I would love to win for my cousin as he loves trains and this looks great fun! l’d love this prize ‘cos my grandsons adore Thomas and that’s what Grannies do isn’t it . . . spoil their grandsons? I’d love to win for our son, I’d put it away for Christmas – it will soon be here! This is crazy… my brother who’s just short of 21 years old had this as a child and we both loved it. Now I’m hoping to win it for my own son!! My son loves Thomas so this would be great for his birthday coming up. This would be awesome for my niece, she’s obsessed with Thomas!! We have Thomas and Friends fan who would just love this prize. Would provide much fun and entertainment for him. I have a train mad little grandson. I would love to win this for my nephews who would love this. I would love to win this for my nephew who adores Thomas and anything to do with trains. My nephew would love this prize, he’s obsessed with trains. Thomas is much loved by all and I’d love to give this to my friend’s son for Christmas. I have a new little grandson so would love to win this for him as I know he and his Dad will get so much enjoyment playing with it! My nephew just loves his Thomas & Friends so much! To make my grandsons face light up. Loving your blog I also love travelling so I am finding this very interesting, I entered this as my grandson is very much into Thomas and would love this. I would love to win this for my niece she is a big Thomas fan! My 3 little boys would love to win this – they are all Thomas daft – ould keep them happy for hours! I want to win it to giveaway to my nephew as he would be very happy! My son had a very similar set to this one many years ago and he adored it! I’d love to win this for my grandson. My grandson loves Thomas and we have to watch him on binge watch most days!! This would be perfect for my youngest son, he is Thomas mad! I would love to win this for my youngest who is a massive Thomas Fan. My son loves Thomas, he would be over the moon with this. Great giveaway. My neice has just had a little lad . he will no doubt be into thomas! This is a great prize! My niece is Thomas mad, would love to be able to give this to her! This would make for an epic xmas present for my 2 boys! My little girl loves cars and trains – she would be delighted to win this! Ooooh my little boy would love this! He loves anything with wheels so this would be perfect for him for Christmas! I will love to win for my nephew, he will love it. Perfect gift. It would make a fantastic present for my youngest (and I love playing with trains, too, shh!). Thomas and friends is a firm favourite with both my grandsons! I don’t believe they have this set! Fab giveaway. I’d love to win this because I absolutely loved my big loader when I was young, and we are big Thomas fans in this house so this one would be even better! This would be wonderful for my train obsessed little grandaughter, I would put it away until christmas for her……..
My son-in-law loves reading Thomas stories to my granddaughter. She’s nearly three and would love having her daddy play trains with her too. I would like this for my youngest grandson because he loves trains! My nephew is completely crazy about Thomas and this would be perfect for his 2nd birthday! I’d love to win it for my 4 year old twins, they’re Thomas mad! i would love to win for my son who loves thomas! I’d let the kids in my childminding setting play with this as Thomas is a firm favourite. My little nephew adores trains, he would love this. i loved thomas growing up. i used to read the books with the cassette tapes to play along while you read. So glad baby Damon has inherited my love of thomas. he’d love this.